Let your first bartender know you are 21 and ready to be carded for the first time in one of these fun, novelty 21st Birthday Personalized T-Shirts. Your 21st Birthday Personalized Shirt is available on our premium white 100% cotton Personalized T-Shirt, machine washable in adult sizes S-3XL. Also available in Ash Gray. 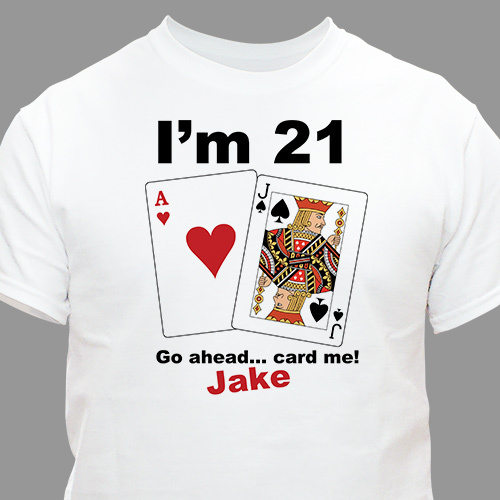 Personalize your Card Me Custom 21st Birthday T-Shirt with any name. The shirt is high quality, the printing is vivid and the name I had printed on the shirt was spelled correctly and look great. GiftsForYouNow.com has a large variety of Personalized 21st Birthday Gifts for your Son, Daughter, Sister or Brother. Create something special just for them for their special birthday. Our Personalized Birthday Shirts are unique gifts any time of the year. GiftsForYouNow.com has a vast selection of Personalized Milestone Birthday Gifts as well.